I have a few random thoughts floating around that I thought I'd plant here for awhile. Later, in that mythical place call "the future", when I think I will have more time, perhaps I'll come back and see how these ideas are doing. 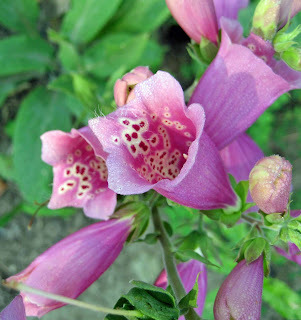 I am sure by now that everyone knows the little spots inside of foxglove blooms are garden fairy footprints. If that is the case, I believe one could logically draw the conclusion that the spots on the backs of a gardener's hand are also fairy footprints. Calling these spots fairy footprints sounds a lot better than calling them age spots. Yes, the next time someone looks at the back of my hands and even thinks "age spots", I'll let them know that those are fairy footprints and I am proud that after years of gardening, the garden fairies feel comfortable enough around me to step on my hands whenever I pause while planting or weeding. Speaking of garden fairies, I found out in their latest post that garden fairies often get trapped in old gardening books, so we should "mind the book fairies" when we open old gardening books. They need a few minutes to wake up, stretch, get their bearings and then make their escape. Some of them have apparently been in those books for quite some time, as I've found out. I've been on an old gardening book buying spree and there are book fairies everywhere. "I suppose no one who loves his garden is entirely without books on his favourite subject; and, indeed, I have always found that a lover of gardens and flowers is also more or less a lover and reader of books." After reading this, I thought that if I ever joined a book club or started one, I would call it The Vicar Ellacombe Garden Literary Society. Then I thought that such a society should have someone in charge of it with a name like Lady Daphne Hortus-Wellington-Cloverberry. Her parents would be Lord Neville Hortus-Wellington-Cloverberry and Lady Agnes Hortus-Wellington-Cloverberry. Lady Daphne would also have a brother, Lord Basil Hortus-Wellington-Cloverberry. Lord Neville and Lady Agnes would have a dream that someday their daughter, Daphne, might fall in love with a good botanist or horticulturist who could help them return the gardens of their estate, known as Cloverberry Castle, to their former glory. Lady Daphne and her botanist husband would live nearby in Cloverberry Cottage. Well, that all seems just a wee bit complicated, so maybe I'll just appoint myself as the chairperson of The Vicar Ellacombe Garden Literary Society, at least for now. Those are my thoughts these days. The seeds are planted. We'll see what grows. I would love to join The Vicar Ellacombe Garden Literary Society and I'll second the motion as you (Carol) as the chairperson. P.S. - I also have some fairy footprints on the back of my hand. I'm in if we're forming....an online book discussion club? Wonder how it will work? Loved the idea of fairy footprints on the back of gardening hands.Age spots are very well brought in relation to fairy footprints.Nice thought! Thanks for sponsoring another glorious year of GBBDs along with your ever present delightful posts. May the Garden Fairies bring you many more wonderful surprises in 2013.